Technology, Literature and Culture provides a detailed and accessible exploration of the ways in which literature across the twentieth century has represented the inescapable presence and progress of technology. As this study argues, from the Fordist revolution in manufacturing to computers and the internet, technology has reconfigured our relationship to ourselves, each other, and to the tools and material we use. The book considers such key topics as the legacy of late-nineteenth century technology, the literary engagement with cinema and radio, the place of typewriters and computers in formal and thematic literary innovations, the representations of technology in spy fiction and the figures of the robot and the cyborg. It considers the importance of broadcast technology and the internet in literature and covers major literary movements including modernism, cold war writing, postmodernism and the emergence of new textualities at the end of the century. An insightful and wide-ranging study, Technology, Literature and Culture offers close readings of writers such as Virginia Woolf, Samuel Beckett, Ian Fleming, Kurt Vonnegut, Don DeLillo, Jeanette Winterson and Shelley Jackson. It is an invaluable resource for students and scholars alike in literary and cultural studies, and also introduces the topic to a general reader interested in the role of technology in the twentieth century. Alex Goody is Reader in Twentieth Century Literature at Oxford Brookes University. 1. Introduction: The Twentieth-Century Technological Imaginary. 2. Writing Technology: Literature and Theory. 3. Media Technologies and Modern Culture. 5. Technological Texts: from Typewriters to Hypermedia. 6. Robots, Cyborgs and the Technological Body. "It is undoubtedly the broad engagement with popular and avant-garde culture, and the inclusion of technologies of production, destruction, replication, communication, transmission and reception that make the book so useful as a resource for researchers approaching the topic from a range of literary and cultural contexts, as well as a starting point for further study in the field. Though wide-ranging, the readings are never lacking in interest, managing to convey insightful, sophisticated and convincing arguments in accessible prose." "From railways to C3 systems, Kipling to Kittler, Alex Goody draws deftly on a remarkable range of examples to chart the modern technological imaginary. She produces a useful and accessible overview of technology's politico-cultural manifestations and an excellent survey of the theoretical underpinnings of recent scholarly approaches to the field." "This compelling study poses searching questions about modern subjectivities by exploring the intimate relationship between writing and technology. Goody persuasively demonstrates the intricate ways in which technology is embedded in popular and avant-garde culture, from Victorian technologies of electricity and photography to the management, robotic, military and leisure technologies of the twentieth and twenty-first centuries." "From the train crash to the photograph to the typewriter to hypertext, Alex Goody's deft introduction to technology, literature and culture is as enlightening as it is pleasurable to read. 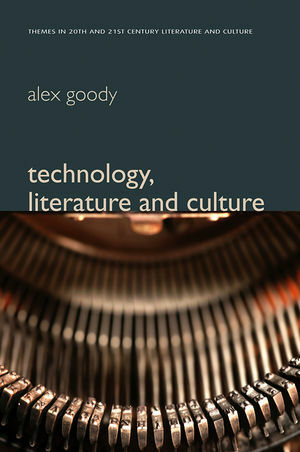 Containing sophisticated arguments linking a range of theorists of technology, including Benjamin, McLuhan, Kittler, Jameson and Haraway, Goody also illuminates the unexpected ways in which nineteenth- and twentieth-century literature interacts with the technological developments of modernity. Whether your primary interest is modernist poetry, cyberpunk, James Bond or death by electrocution, this book has something for you." An overview of the topic of technology in literature, covering the span from late Victorian innovations, through modernism and the cold war, to computing and the internet. Brings together a wide range of literature in a concise, student-oriented fashion. Balances theory with close readings of key authors including Virginia Woolf, Samuel Beckett, Ian Fleming, Kurt Vonnegut, Don DeLillo, Jeanette Winterson and Shelley Jackson. Part of Polity's successful Themes in 20th and 21st Century Literature series.